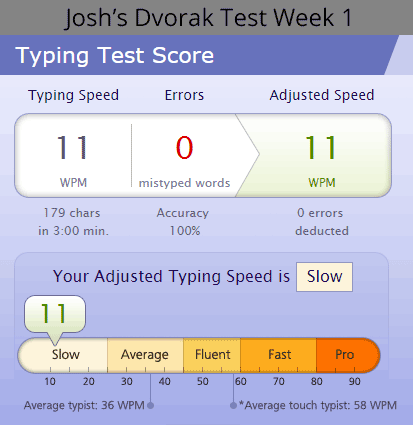 Mostly, I’ve been using the Learn Dvorak keyboard training, which you can check out here. I like that you can choose to map your Qwerty keyboard to Dvorak without having to change anything else. It also has “lessons” where you can run through the Dvorak home keys and then add others by typing actual words. I have played around with it throughout the day, I would say averaging about 30 minutes a day. I first thought I would stick with a specific lesson until I “mastered” it, but I realized that would put me in a tough spot when it came time for my first typing test. So, I’ve gone through each of them a few times. The progress is slow so far, but here are a couple points I’ve picked up. The Dvorak keyboard layout does make a lot more sense. This is pretty obvious when you see how many words you can make from the basic home keys, the ones that don’t require you to ever move your fingers. Here’s a random selection: hose, tuna, aunt, snoot, teen, shots. Compared to the Qwerty, (adds, Alaska, dads, lass, flask), the obvious difference is the vowels. With Dvorak, you get them all except “i”, which is still on the home row. In Qwerty, you get “a”. Yup, just one vowel. According to the references I’ve looked at, the possible English words on the Qwerty home row, including moving the index finger for “g” and “h” tops out at under 200. And it includes many that only a Scrabble lover could appreciate. (But you do get the semi-colon!) As for how well these advantages play out, I think I’ll get a better sense of it as I go along. Fun fact: one of the serendipitous combinations I got when moving to the full Dvorak keyboard was “joshing egoist”, which you can take however you wish. Switching keyboard layouts is simple, but it isn’t easy. Typing, for me at this point, falls into the category of “things you do every day, without thinking.” I suppose I knew that before, but trying a new layout really throws that in your face. It felt similar to learning a new language to me, or maybe it reminded me what it was like to learn how to type at the very beginning. Although, even that doesn’t quite compare because when I learned for the first time, I didn’t have a reference point. It made me think about what it must be like for someone who has had a significant injury and is forced to relearn how to walk or write. I still don’t think I could imagine how excruciating that must be, but I think the keyboard layout switch gives me a little insight. I’m sure one of the major differences is that there are no major consequences with this experiment, so that relieves much of the stress and frustration. It is certainly a good exercise in patience, though. The early part of the learning curve can be fun and maybe addictive. It is pretty easy to see small victories when practicing. It feels good to correctly remember where a letter is without having to “cheat” or take forever thinking about it. And the practice itself doesn’t require a lot of thinking, just concentration. It can be a bit of a break, like playing a game. However, just like with playing games, it is easy to turn to it to avoid “real” work. I found myself thinking, more than once, “Eh, I don’t want to think about X right now. I could just do some typing instead.” And it can actually be more dangerous than a typical game because I feel like I am being productive in learning this new skill. I have to be conscious of what is truly important and what is more of a side project. Sometimes that introspection can be difficult. Using typing practice as a form of procrastination is something I’ll have to watch for. I’m not ready to make the switch to Dvorak. If I went completely cold turkey, I would probably be much further along in my Dvorak skills, but I can’t really imagine how much slower all of my work would have gone. It would be hours and hours I think. For now, I will stick with the slower transition. I am considering switching over to Dvorak for the occasional email, etc. when I have time instead of just doing the separate practice. In part, because I’ve found that it is a different situation when you are trying to compose in your mind and remember where letters are at the same time. So, that’s where I stand right now. Let me know if you have any questions or if you’re playing along at home. Thanks for reading.